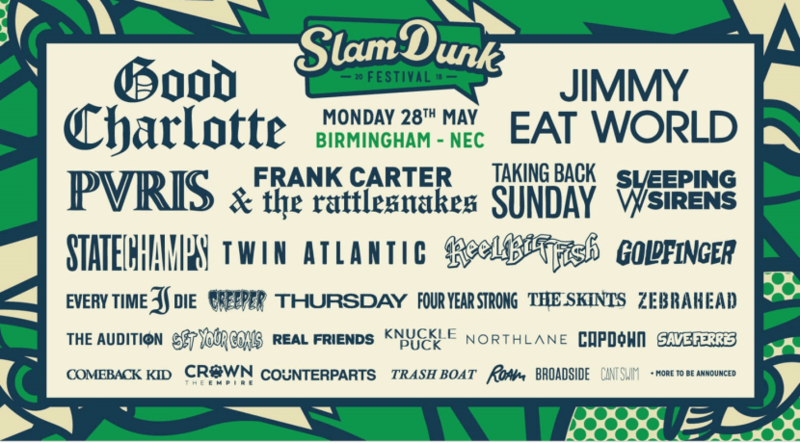 On the 28th May, Slam Dunk Festival 2018 will be coming to the NEC in Birmingham for the Midlands date of the 3-day festival. Doors open at the NEC from 12:30pm, with tickets are priced at £54.80 plus booking fee – as presented by Slam Dunk Ltd. For direct information on Slam Dunk Festival 2018, including details on all the events happening across the UK, click here. For a direct link to online ticket sales for Slam Dunk Festival 2018 (Midlands), click here. Starting in 2006, Slam Dunk Festival has grown over the years into an inaugural part of every pop punk and rock fan’s calendar. With 6 stages hosting countless bands, and thousands of fans flocking to sites across the UK year upon year, it’s been promised that 2018’s line up will be the pinnacle of the festival so far. As per usual, the festival is being split into 6 stages – ensuring it can cater for any fans tastes, be that acoustic or pop punk. 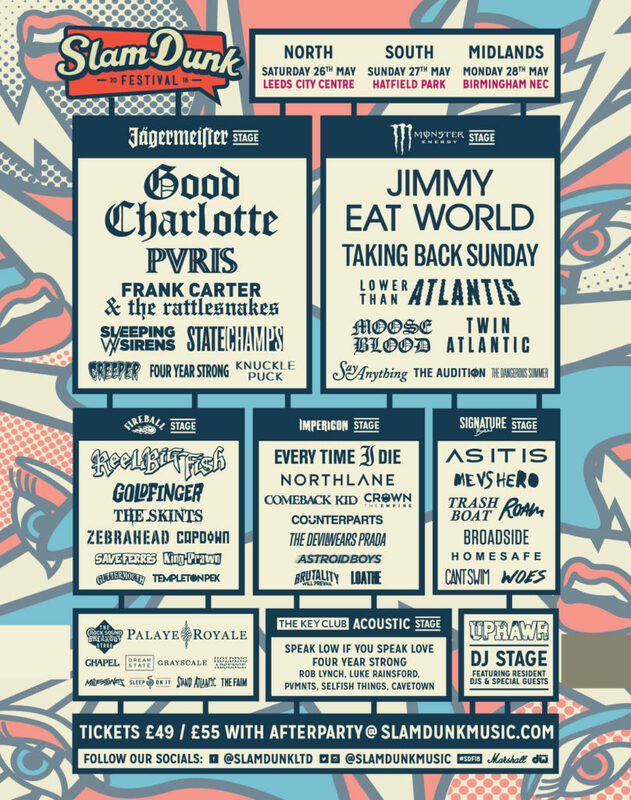 Headliners this year include Good Charlotte and Jimmy Eat World, who are both making their debut Slam Dunk appearances at the 2018 festivals, alongside Taking Back Sunday, Frank Carter & the Rattlesnakes, and Sleeping with Sirens. Having recently completed a UK tour, alt rock band PVRIS will be back in Birmingham performing on the Jägermeister Stage – along with State Champs, Knuckle Puck, Four Year Strong, and Southampton’s horror rock band Creeper. To read our Birmingham Review of when PVRIS came to the O2 Academy Birmingham, click here. The Monster Stage will be home to bands such as Twin Atlantic and Moose Blood, while the Fireball Stage will host Slam Dunk favorites Zebrahead and Reel Big Fish. However, it’s the smaller stages where many of the festival’s gems really lie – with up and coming bands such as Holding Absence, Loathe, Stand Atlantic and Astroid Boys all making appearances at this year’s festival. The acoustic Key Club Stage is looking to be a belter too, with Birmingham’s Luke Rainsford performing alongside Speak Low If You Speak Love and an extra stripped back set from Four Year Strong. The rounding off the night will be the Slam Dunk Festival 2018 after party, hosted by Birmingham’s alternative club night UPRAWR – held in the Genting Arena Forum from 11pm to 3am. So a bit to keep you busy on the Bank Holiday, and with an uber strong line up of the scene’s great, good and going to be HUGE tickets are likely to sell out. You might want to scrap your pennies together a little quickly – this year’s Slam Dunk Festival is looking to quite possibly be the best yet. For more on the Slam Dunk Festival 2018 after party – hosted by UPRAWR, click here.